Dreaming of Dolls: MCM Meet Up! After I left MCM, I met up with two more doll friends from the Internet. After meeting Neth for the first time, that makes three of my Internet friends that I got to see! 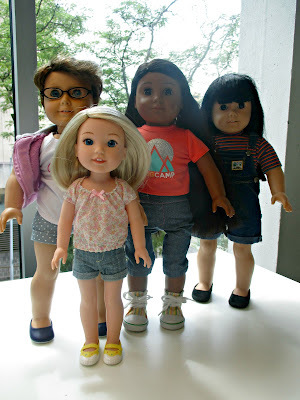 I met up with two members of American Girl Collectors, Elewys and Marycontraria. We had a good time talking. Well, I did get lost on foot at one point, but they came and rescued me! Yay for friends with a better sense of direction than me! If it hadn't been for cell phones, they might have never seen me again. Yay for modern technology! Here is Anne hanging out with Marycontraria's dolls. 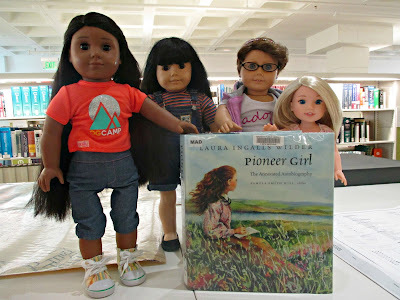 Frances is the Kaya doll, Nora is the cute custom doll with short brown hair, and the Camille doll is Nora's younger sister. They look like they are having as much fun as I did! Very cool! I'm hoping to meet some bloggers in the coming year. It's so rare to find doll enthusiasts IRL. Yes, it is! It's really fun to get to meet Internet friends.